Growing up, one of my all-time favorite stories was Peter Pan by J. M. Barrie. Having been disappointed by a retelling before, I was a little hesitant to give another one a shot. Then I saw that Second Star was a modern retelling focused on Wendy and involving coastal beauty and surfing. I anticipated a departure from the original story, so I was prepared for just how far it would venture... mostly. 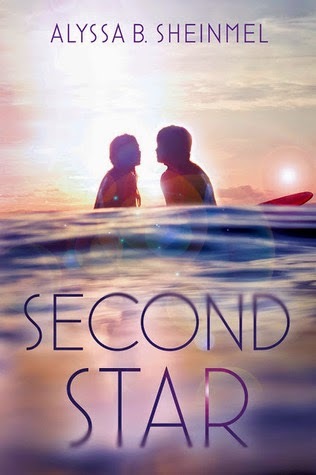 Second Star follows Wendy as she searches for her missing, surfing addicted brothers, Michael and John. Everybody believes they died in a surfing accident, but Wendy is convinced they're still alive somewhere, chasing that perfect wave. Her parents are a mess and their glass house might as well be a ghost house, but Wendy is determined to push through the grief, find her brothers and bring them home. During her search, she meets new friends and a love for surfing and freedom she could never have imagined. For the most part, I guess I liked Wendy. She was gutsy and determined, but she made some awful decisions along the way. Of course I know that nobody is perfect, but some of these decisions seemed so far out of left field, it was hard to think of them as just another teenage experience. There were two different cases of insta-love and neither of them seemed to be one bit realistic or make any sense at all. First we have Pete, a tall surfer squatting in an abandoned beach-side house, taking care of a ragtag team of surfers. He's fun and loyal and a pretty good friend, doing what he thinks best for those he cares for, but he's not perfect and isn't always right. The other love interest is Jas, a drug-dealing surfer guy. He's tall and handsome, but he's bad news. It's clear to me that a drug dealer is bad news, but apparently it isn't to Wendy. She falls for both of these guys and almost seems to forget she's searching for her brothers. Now that I think of it, I wonder if that was a way the author was bringing in the magic of Neverland and how it makes you forget. Who knows. Regardless, Wendy almost forgets her mission, falls for two fairly flat male characters and makes some really bad decisions along the way, in my opinion. There were some plot points that didn't exactly make sense to me. Some bits didn't seem to fit in with the rest of the story and left me a bit puzzled as to what purpose they had. I enjoyed the surfing and getting to feel a bit like a beach dweller, but I would have been more interested in the mystery of the missing brothers being the focus. It was good to see Wendy work through some grief, though. I might not have gone about it the same way, but she was able to find a way for her. So there's this nice journey, meeting new people, self-discovery, romance and what have you, but then comes the ending. I think I would have enjoyed this story so much more if it wasn't for how disappointed I was with that ending. So much happens to Wendy - some of which you don't know whether it is real or an illusion - that when that ending comes, it just leaves you... wanting. Though I may not have been overly fond of some of the characters - and some confusing bits of story - the images that Alyssa Sheinmel was able to paint in my mind left me wanting to jump in the ocean and find my own adventure. There were numerous times I found myself practically hearing the ocean, feeling the breeze and smelling the salty air. I wanted to get out there and learn how to surf, especially if a cute guy was teaching me. So yeah, the author knocked it out of the park in that area. References to the story of inspiration was a treat. The beach area where Pete and Jas and everyone resides is Kensington (like Kensington Gardens... get it?). The drug Jas peddles is called "fairy dust" and at one point there's a scary bar called the Jolly Roger. Not only that, but one of Pete's crew is a fiery, short, blonde girl named Belle. Second Star has some amazing imagery and an intriguing journey of discovery and healing for our main lady, Wendy. Though some bits fell short for me, I can say that the story kept me interested. I was able to guess a few things that happened, but most of the time I didn't. Whether or not that was a good or bad thing, I'll leave that for the next reader to decide. I had a good time "visiting" the coast and getting to see this new take on Peter Pan, but in the end, I was left wanting. Will I give up on Peter Pan retellings? Absolutely not. Will I read this again? Um, probably not, but I don't regret giving it a shot. I am seeing a lot of reviews that are similar to yours on this book, many two stars or lower. It makes me sad because I too loved Peter Pan when I was younger, and this synopsis shows so much promise. But, with flat male characters and a bad decision making lead I think I'm going to pass on this one. Thanks for the great review! Yeah, it did have a lot of promise. Makes me a bit sad, but oh well. If you'd like to read it, the imagery is beautiful enough that you might like it. Never know! Thanks for your comment! !